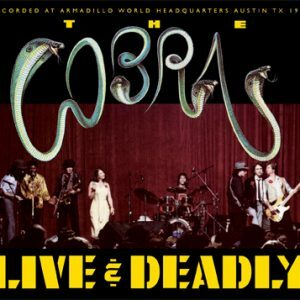 On a madly magical full-moon night in November of 1979, the legendary Cobras seized the stage at Armadillo World Headquarters, the concert venue that put Austin, Texas, on the international live music map. The ‘Dillo was rockin’ the planet that night, as Rodney Craig, Larry Lange, Denny Freeman, Paul Constantine, Joe Sublett, and Larry Williams, with Special Guests Paul Ray and Angela Strehli, tore it apart and put it back together for a roomful of some of the happiest boogyin’ people ever! The whole rockin’ shebang was captured in glorious old-school style to 1” analog tape, and in December of that year choice bits were selected for mixdown to fit onto the 12” vinyl LP platter of the bygone day. The music on this CD was transferred directly from the analog 1/4” stereo masters from those mixing sessions. Maybe you were there and maybe you weren’t. In either case this recording is a ticket to get there now. The medium may have changed; the message remains. This is the real thing, born at the headwaters of human passion and nurtured in the watershed of desire. Handle with care. This is a ticket to party. Native Dallasite Paul Ray described the “great migration” in the summer of ’70 when he (and wife Diana), Denny Freeman, Jimmie Vaughan, and Doyle Bramhall all headed for Austin, forming the core of an emerging blues scene. In various configurations (Texas Storm, then Storm, Southern Feeling with bassist Alex Napier and drummer Rodney Craig, et al), this core became the “house band” at La Cucaracha in the summer of ’74, finally becoming Paul Ray & the Cobras (the name of Doyle’s first band). They held forth regularly on Tuesdays at Soap Creek Saloon and Wednesdays at the One Knite. In 1975, a young Stevie Ray Vaughan took brother Jimmie’s place, but later joined Doyle when he left to play with Marc Benno and the Nightcrawlers, whereupon Lubbock transplant Rodney took over drums from Doyle. The band coalesced in 1976 with Paul moving out front and Alex providing bass, adding Joe Sublett on sax, and soon after Paul Constantine on trumpet. In 1977, in the Austin Sun’s third annual reader’s poll, the Cobras were voted Band of the Year. At the same time they were releasing a single which enjoyed local and regional airplay, and began having some great nights at newly opened Antone’s, soon to become a Mecca for the revival of the blues. Following a throat operation, Paul retired from singing, replaced by Bobby Hocking, and then Alex moved on, replaced by Larry Lange on bass. In 1978, Bobby moved on and the vocals were covered by Rodney (with frequent guest help from Angela Strehli) until the band found Larry Williams. 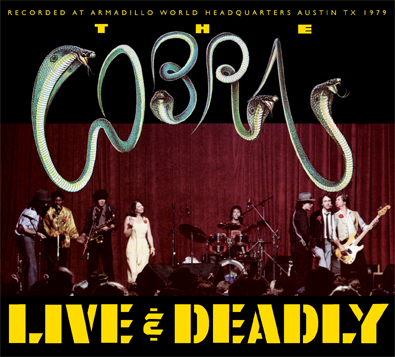 In early 1979, Gerry Storm, longtime fan and Secretary-Treasurer of the Austin Federation of Musicians, decided to push the band to the next level by recording a live album (with then current members and guest spots from Paul and Angela). 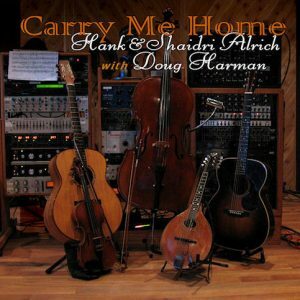 He approached Hank Alrich about recording a concert at Armadillo World Headquarters for release on Armadillo Records. All went according to plan – great show, great recording, even released a single that enjoyed some airplay and created a buzz! Unfortunately, all this happened just as AWHQ was closing its doors and the band was disbanding, so the LP, with test pressings and artwork all in the can, was never released. Digitally remastered from the original ¼” analog tapes with the original graphics redesigned for a CD package, after thirty-two years Live & Deadly is more than an historical recording at a legendary venue from a bygone band. It is a living and breathing capture of the timeless quality of the blues and the power of live music. In the ensuing years, after members went their separate ways in 1984, they have continued to come together recurrently, especially for Christmas shows at the Continental Club where in 1982 they had recorded a very rare mini-LP called Cobras Caught Live on Big Money Records (including Larry “Junior Medlow” Williams who succumbed to cancer in 1997). Their 2011 Annual Holidaze Reunion at the Continental will be on December 30. The Cobras are longtime flag-wavers for the proud tradition of rhythm and blues road bands, and have also become local heroes for their ability to rally local audiences around non-country music in the mid-’70’s ­- no small feat here in the middle of Willie Jeff Jennings country. What we hear will singe the ears, sending blue flames rocketing through soul brothers and sisters near and far. It’s like a fireworks stash got torched, and goes off for a full hour. Seriously. The only thing wrong with this disc? It came out 30 years late.